Bradley Ritter, Judeans in the Greek Cities of the Roman Empire. Rights, Citizenship and Civil Discord. (Supplements to the Journal for the Study of Judaism 170) Leiden; Brill, May 2015 (€126,00 / $163.00). In the first century CE, Philo of Alexandria and Josephus offer vivid descriptions of conflicts between Judeans and Greeks in Greek cities of the Roman Empire over various issues, including the Judeans’ civic identity, the extent of their obligations to local cities and cults, and the potential security threat they posed to those cities. This study analyzes the narratives of these conflicts, investigating what citizenship status Judeans enjoyed, their political influence and whether they enjoyed the right to establish institutions for observing their ancestral worship. For these narratives to be understood properly, it should be assumed that many Judeans were already citizens of their cities, and that this status played a central role in those conflicts. You can find a description of the contents here. Contents. I am looking forward to this book, both because it is relevant for my own present writing, and because it might provide some more insights for understanding the social world of Philo, especially sinece it appears to be written by a classicist. NotaBene.com has launched their latest version of their terrific program today; NotaBene 10 Plus. and/or see what is new in the latest version by going here. Religion in the Roman Empire(RRE) hat das Ziel, neue und integrative Perspektiven auf Religion in der antiken Welt mit Hilfe einer fächerübergreifenden Methodologie zu fördern und abzubilden. Ausgehend von der Idee der “gelebten Religion” bietet RRE die Möglichkeit, neue, im Entstehen begriffene Forschungsarbeiten aufzugreifen und weiterzuführen. Dadurch können die Fächergrenzen zwischen Religionsgeschichte, Archäologie, Anthropologie, Altphilologie, Alter Geschichte, jüdischer Geschichte, rabbinischen Studien, der Wissenschaft vom Neuen Testament und frühen Christentum, der Patristik, koptischen Studien, gnostischen und manichäischen Studien und Arbeiten zur Spätantike und orientalischen Sprachen überwunden werden. Wir hoffen, die Entwicklung neuer Forschungsansätze anzuregen, die die lokale und globale Entwicklung der multidimensionalen pluralistischen Religionen der Antike erfassen. The journal is edited by: Reinhard Feldmeier (Göttingen), Karen L. King (Harvard, MA), Rubina Raja (Aarhus), Annette Yoshiko Reed (Philadelphia, PA), Christoph Riedweg (Zürich), Jörg Rüpke (Erfurt), Seth Schwartz (New York, NY), Christopher Smith (Rome), Markus Vinzent (London) . Mohr Siebeck grants all readers free access to this very first issue as a sample copy. You can download a PDF of the first issue here: [link]. Lara Weiss: The Consumption of Religion in Roman Karanis (pp. 71–94). Thanks to Torsten Jantsch, and his blog Verbum et Fides, for this info. Last Monday, April 13th, several members of a Norwegian society (Norsk Nytestamentlig Forskerforum), were gathered for their Spring meeting at the University of Nordland, Bodø. Usually their metings are held in Oslo, but this time we were also participating in a special event: The thological library of Prof. em. Peder Borgen, were handed over to the library at the University. Hence the session before lunch were dedicated to the studies of Philo of Alexandria. At left here, you see Prof. dr. Per Jarle Bekken giving a presentation of the various works of prof. Borgen. Prof. Bekken, now a professor at the University of Nordland, is one of the former doctoral students of prof. Borgen, and very happy for having the local university library getting updated and expanded with relevant literature on the Bible, ancient Judaism, and even some volumes on Norwegian church history. On Bekken, see here and here. 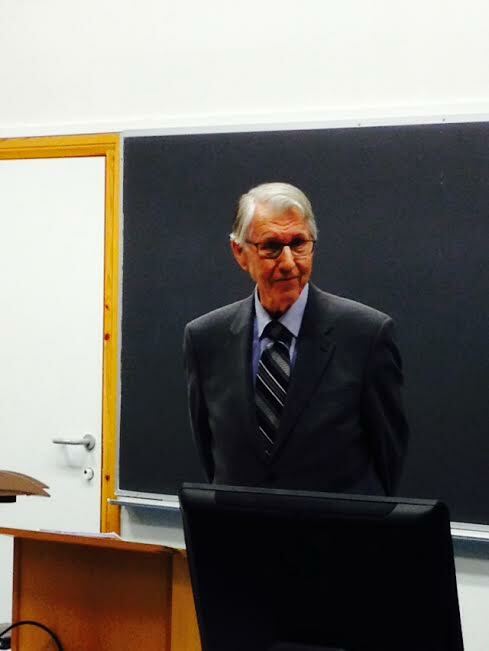 Prof. Peder Borgen (87 last January! ), then held the main lecture this morning on Encyclical education and Religion. It was an impressive presentation by one who have made the study of Philo a main focus in his scholarly works for the last five to six decades. We also got a broader understanding of how much his celebrated dissertation (published by Brill in 1964,republished in 1981; now out of stock, but a paperback version is said to be published soon) represents for his own studies and for a better understanding of Philo, and how relevant ideas in this volume as well as in later Philo studies by Borgen still are today for understanding the – in many ways enigmatic – figure of Philo of Alexandria. For myself it was another reminder of much the synagogue and the Jewish milieus of Alexandria meant for Philo and his works. After lunch there were yet two other sessions: in the first prof. Bekken presented some issues from his most recent book (The Lawsuit Motif in John’s Gospel from New Perspectives. Jesus Christ, Crucified Criminal and Emperor of the World (Novum Testamentum, Supplements 158; Leiden, Brill, 2014).). 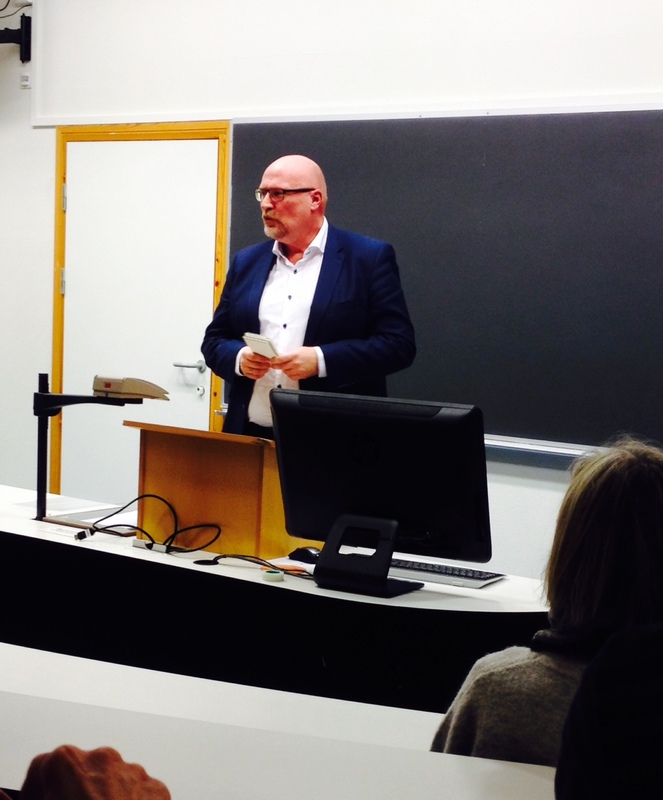 In the other, Prof Karl Olav Sandnes, Norwegian School of Theology (MF), gave an introductory presentation of his present research project, focusing on The Prayer of Jesus in Getsemane. 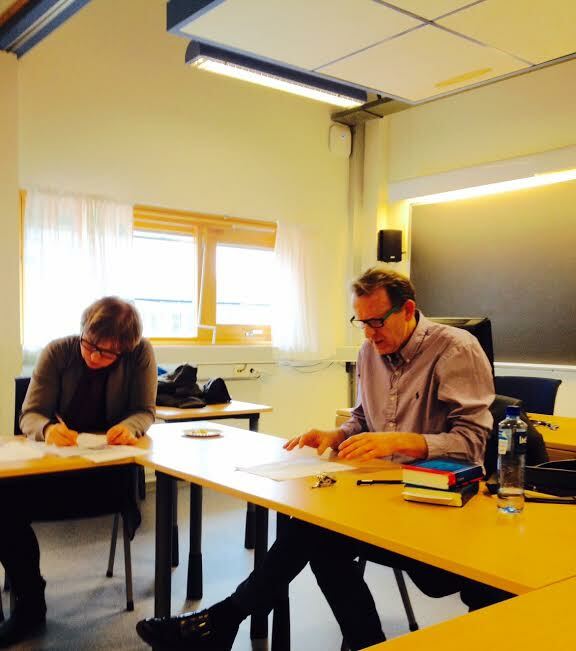 These two last sessions were led by prof. Marianne Bjelland Kartzow, Faculty of Theology (TF), University of Oslo. Philo as a Biblical commentator. The idea behind this book seems to be that by gathering all sayings of Philo concerning a particular passage in the Torah, you get are kind of biblical commentary on these passages as taught by Philo from Alexandria. Hence, the texts of Genesis are given from Genesis 1:1 to Genesis 50:26 in bold types in the text, then follows a compilation of Philo’s sayings relevant for the particular verse from Genesis. These sayings from Philo may be taken from various Philonic books and are suggested to reveal something of how Philo considered the content of that verse. The editor has a rather conservative Jewish view of Philo, and presents views that not all will subscribe to. On the one hand he states that Philo’s sources are as dieverse as can be imagined; however the overwhelming majority of Philo’s biblical citations are from the five books of Moses. Philo also makes use of traditions that appear in the apocryphal of Ben Sirach, and he quotes extensive material that does not appear in the Bible. These interpretations appear in various Midrashim, as well as both Talmud’s and other collections of ethical teachings. In many of these cases, it cannot be known if the Rabbis are influenced by Philo, if Philo influenced the rabbis, or if they both drew from a common oral tradition (pp.12-13). In at least one case he quotes from Fragments in which Philo’s wife is supposed to speak about her husband (p.23). Philo is credited by the editor for having written “the world’s first philosophical exposition of the Torah.” Furthermore, he finds several parallells between the worls of Philo and the Rabbis; Philo probably had an indirect influence on the Midrashim or midrashic interpretation. Why did Philo disappear from history? Sometimes during the second century CE, the Septuagint fell out of favour because the early Christian Church co-opted it, and claimed ownership of the text. With the demise of the Alexandrian community, Aramaic Targums began to grow in popularity as Aramaic supplanted Greek as the lingua franca of Judean and Babylonian Jews. Within a few centuries, attitudes regarding the greek Torah translation became increasingly negative (p. 29). When we read Philo’s expositions of the Pentateuch, we discover how a first century Jewish thinker who was steeped in Hellenistic culture experienced the words of Torah through the prism of Greek philosophy, much like Saadiah Gaon, Maimonides, Gersonides, and numerous other famous medieval Jews thinkers would later do. Thus, in Philo, we receive a distinct impression of how intellectual and committed Jews of late antiquity reinterpreted Judaism in a manner that combined the worlds of tradition and modernity of that era. For modern Jews living in the 21st century and beyond, understanding this create symbiosis holds a valuable key in helping future generations keep the lessons of Torah relevant and philosophically meaningful. Hence, the editor says, “to facilitate this fusion of ideas, I have throughout this work created a dialogue for the reader to see Philo’s writings with comparisons to many of the great thinkers – Jewish and Christian – who came after him . With the 21st-century tools of literary criticism, anthropological, mythical, and psychological theories of people like Freud, Jung, Eliade, Barth, Derrida, Campbell, and others, we can create a new context for us to hear the words of Philo cascading trough the waves of time” (p. 31). While the publication of such a volume might be interesting to many, there remains also some questions. The one is, to what degree has the editor manages to vacuum Philo’s works for all the relevant sayings of Philo; second, the passages are taken out of their Philonic literary and ideological context; what consequences does that have for their interpretations. Nevertheless, it is interesting to read and see how the editor uses Philo, and how he adds comments and some other texts and views. “Philo lived at a time much like our own, with people struggling to find their place in a world challenged by rivaling philosophies. His deep spirituality and religious scholarship, coupled with his profound knowledge of a millennium of Greek literature, makes him a profoundly useful guide for the modern age. Reclaiming Philo as an exegete of peshat puts him in company with the great luminaries of Jewish history—a position that Philo richly deserves. 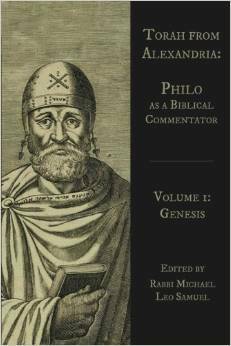 Philo remains as one of Jewish history’s most articulate spokespersons for ethical monotheism. Perhaps more importantly— and justly—Philo’s exegetical skills remain one of the most lasting contributions of the great Alexandrian Jewish community, whose legacy to Jewish history deserves honor and recognition. and a third volume, on Leviticus, is was published this summer. Per Bilde was lecturer/professor at Århus University from 1965 to 2007, when he retired. He was a specialøist in Josephian studies; in his later years, however, he wrote several works on the historical Jesus. A brief bibliography can be found here (from the Norwegian BIBSYS’s catalogue). In memory of prof Bilde,who died in May 2014, there will be a one-day conference at the Århus University May 28, at 2.15 PM to 4:30 PM.